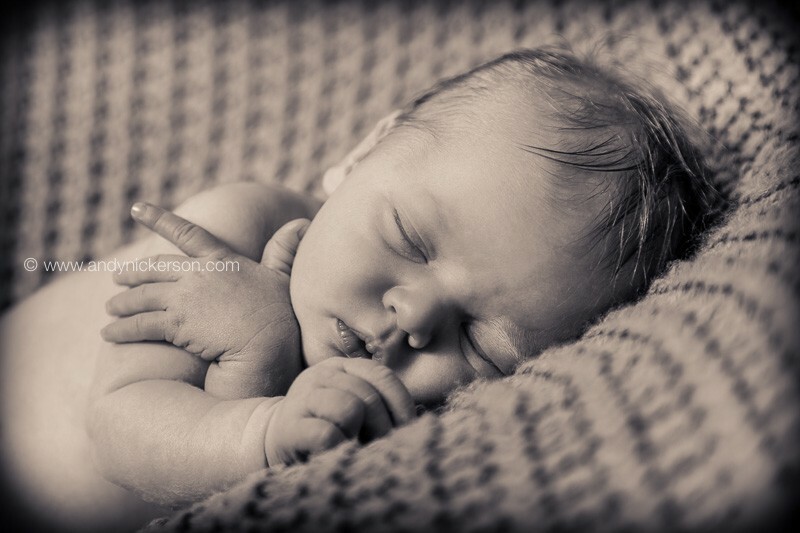 Meet handsome baby Patrick, a tender 6 day old newborn who came all the way up the M1 from sunny London to have his black and white photo’s taken with us. We know it’s a privilege to be chosen as our clients newborn photographer, but perhaps even more so when it involves a trip from London (although its only an hour or so on a good run and the wind behind you). We had the added bonus of being able to chat with mum and dad about our old stomping grounds, having spent 10 years in the big smoke ourselves. The early days of a new baby arriving are so precious, and although our children are school age we’ll never forget those bleary first few weeks, and how challenging timekeeping is to begin with. All credit to Patrick’s mum and dad for being so organised! 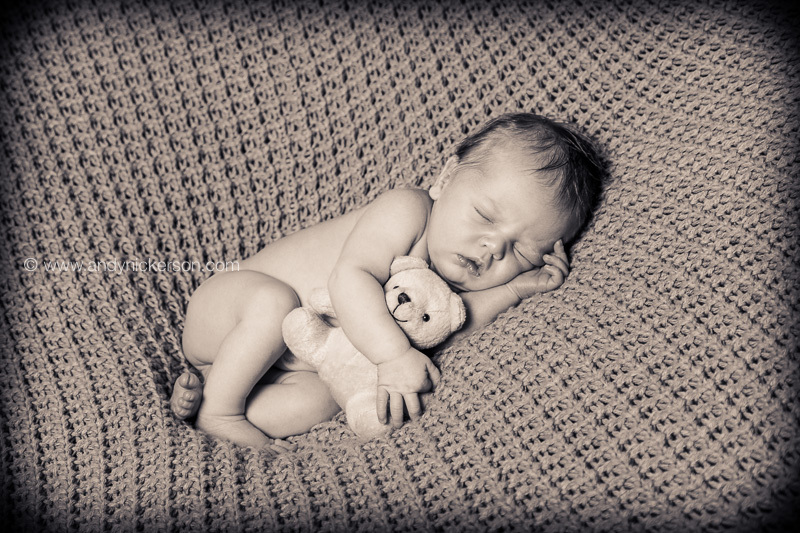 Baby Patrick was incredible; in contented newborn style he fed and snoozed peacefully throughout the shoot, and was placid throughout. In fact he barely made a noise the whole time. He had incredible neck strength as he shuffled into position, lifting his head high to shimmy around before snuggling down into comfy, relaxed positions for deep sleep. It was endearing to watch him snooze with an array of tiny sleepy expressions and smiles, in all honesty some of those smiles were probably caused by wind, but were captivating none the less! Because he was just so lovely and sleepy, Patrick allowed us to capture a variety of comfortable sleepy poses including the shot above where he’s resting his weary head on his hands. It’s important for us to point out at this point that this particular image was retouched afterwards to remove Debbie’s hand that was being used to support Patrick’s head. 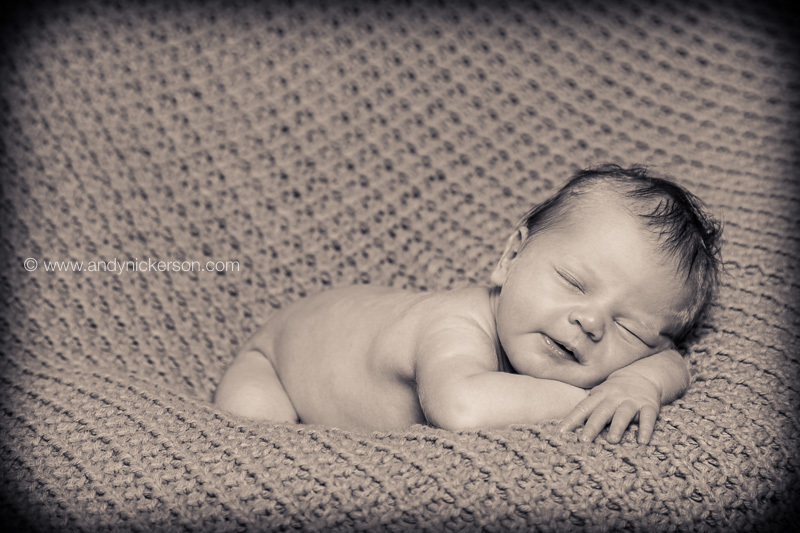 He even graced us with a few lovely eyes open moments right at the end of the shoot, which we always love to capture if baby allows. 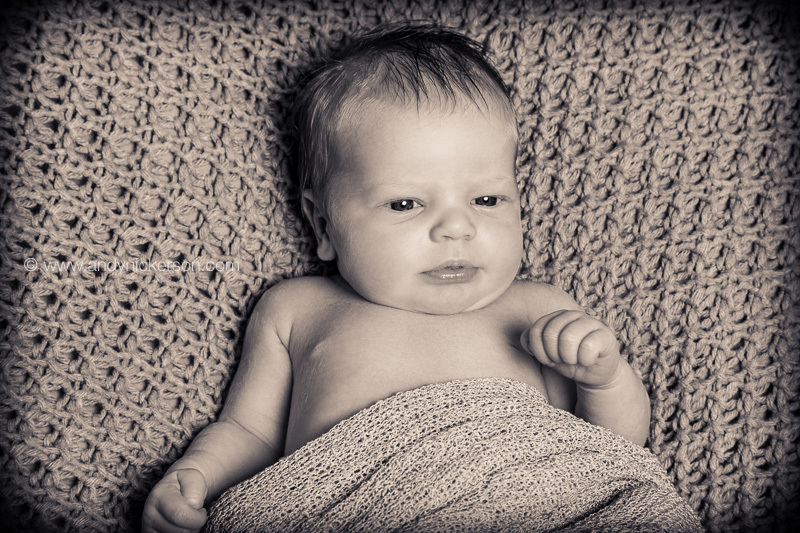 Our trademark photographic style is associated with no fuss or frills, it truly is stripped back to the baby’s natural form and inherent beauty. 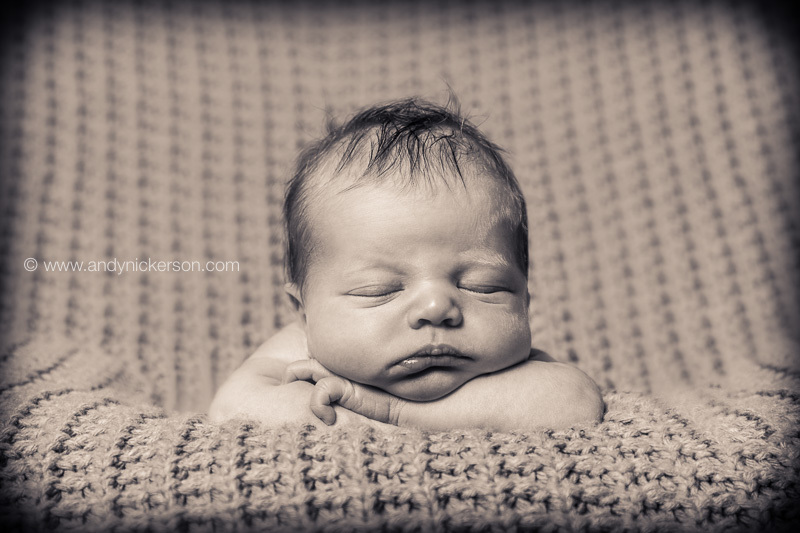 Patrick’s own portraits illustrate how powerful this simple philosophy can be in really capturing the true essence of a newborn’s early days. A big thanks to mum and dad for choosing our style of photography and for such a lovely, relaxed shoot. It was an absolute pleasure to be a part of Patrick’s first few days and lovely to meet you all. 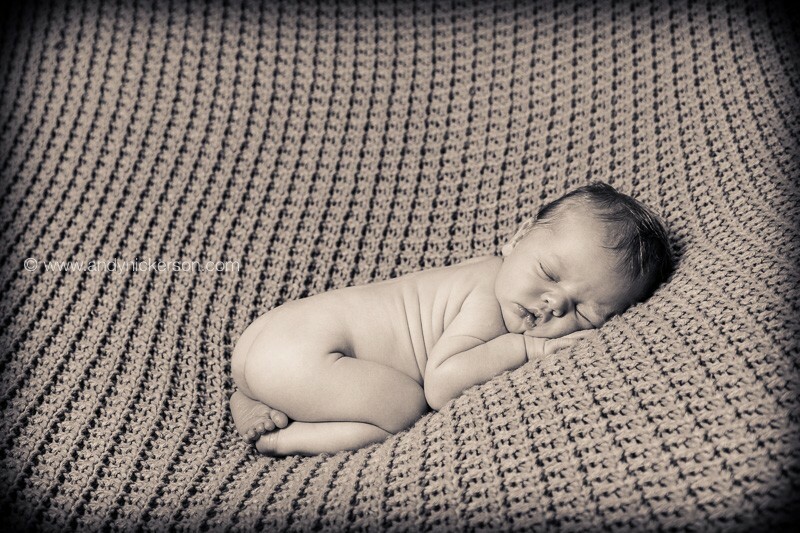 Family Portraits Rugby: Daisy, Poppy and Freddie →← Is Newborn Photography Safe?